A gorgeous story about friendship and working together from a star picture-book partnership, the inimitable Julia Donaldson and award-winning Catherine Rayner. `The Go-Away bird sat up in her nest, With her fine grey wings and her fine grey crest.' One by one, the other birds fly into her tree, wanting to talk or to play, but the Go-Away bird just shakes her head and sends them all away. But then the dangerous Get-You bird comes along, and she soon realizes that she might need some friends after all . . . 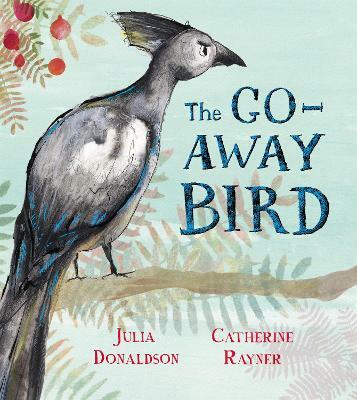 The Go-Away Bird combines brilliant rhyming verse from much-loved children's author Julia Donaldson, creator of the bestselling picture books The Gruffalo and What the Ladybird Heard, with stunning illustrations from the CILIP Kate Greenaway Medal-winning Catherine Rayner. A charming story about the power of friendship from a thrilling creative partnership, this beautiful book is perfect for reading together. Julia Donaldson is the author of some of the world's best-loved children's books, including the modern classic The Gruffalo, which has sold over 17 million copies worldwide, and the hugely successful What the Ladybird Heard adventures. Julia also writes fiction, including the Princess Mirror-Belle books illustrated by Lydia Monks, as well as poems, plays and songs - and her brilliant live shows are always in demand. Catherine Rayner studied illustration at Edinburgh College of Art. Catherine won the Best New Illustrator Award at the Booktrust Early Years Awards for Augustus and His Smile and has been awarded the prestigious CILIP Kate Greenaway Medal. Catherine's other titles for Macmillan include the critically acclaimed Solomon Crocodile and the award-winning Smelly Louie.